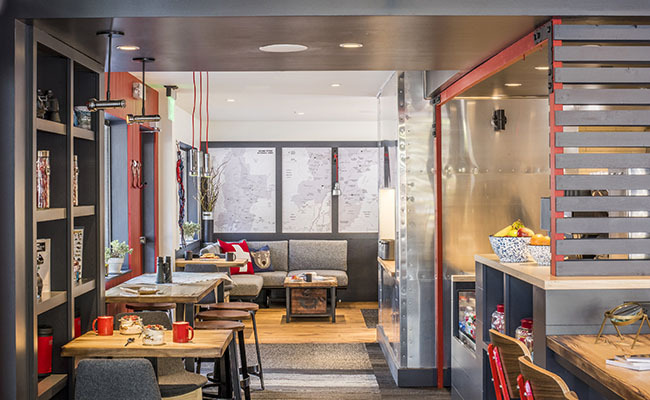 BURLINGTON, VT, November 17, 2017– TruexCullins Architecture + Interior Design won the 2017 Gold Key Award for Excellence in Hospitality Design, Best Lobby – Budget/Focused Service for the contemporary redesign of the Mountain Modern Motel in Jackson, Wyoming. 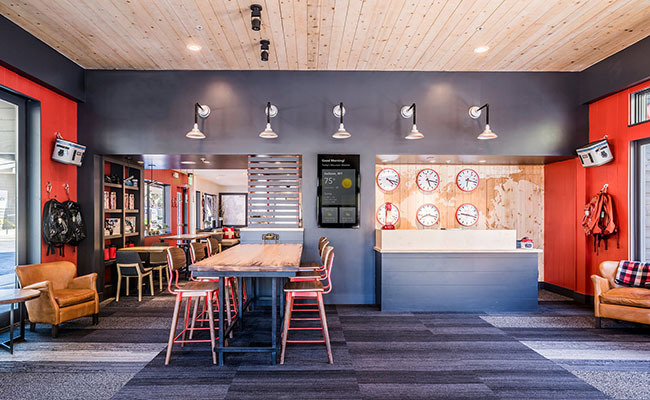 This award recognizes the transformation of the roadside motel, reinventing the standard motel typology and redefining the guest experience for today’s adventure travelers. The Gold Key Award for Excellence in Hospitality Design is presented by Boutique Design Magazine and honors the hospitality industry’s most influential and innovative design work. TruexCullins was one of four finalists in the Best Lobby – Budget/Focused Service category, competing against design teams from London, Canada, and Singapore. TruexCullins Principal Kim Deetjen, Associate Principal Keith Nelson, and Yarrow Group Chief Operating Officer Robert Nolan accepted the award at the Gold Key Awards Gala in New York City, hosted by Boutique Design New York (BDNY) in conjunction with HX: The Hotel Experience. Completed in May 2017, the project consisted of architectural and interior design renovations for three preexisting buildings, totaling 66,500 sq. ft. The property is located at the crossroads of Grand Teton National Park and Gros Ventre Wilderness, a short distance from Yellowstone National Park. 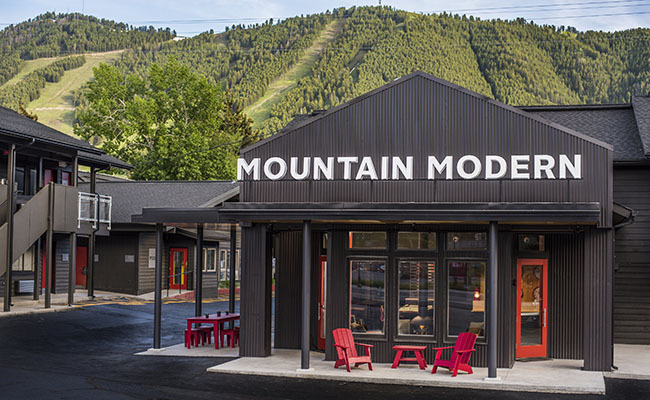 The redesign of the Mountain Modern celebrates the surrounding landscape and highlights the unique culture and spirit of Jackson Hole, repositioning the motel as a “basecamp” destination for adventure sports and wilderness enthusiasts. The Lobby offers more shared and communal space than a typical motel, inviting guests to gather outside of their rooms. 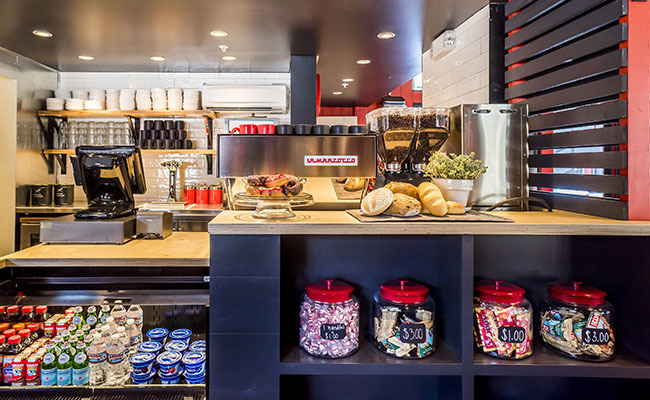 The space features a breakfast room, café, and a lounge with a fireplace and community map table. A color palette of grey, white, and red is complemented with natural wood accents, creating an upbeat and engaging atmosphere that appeals to Jackson’s bold and adventurous outdoor community. 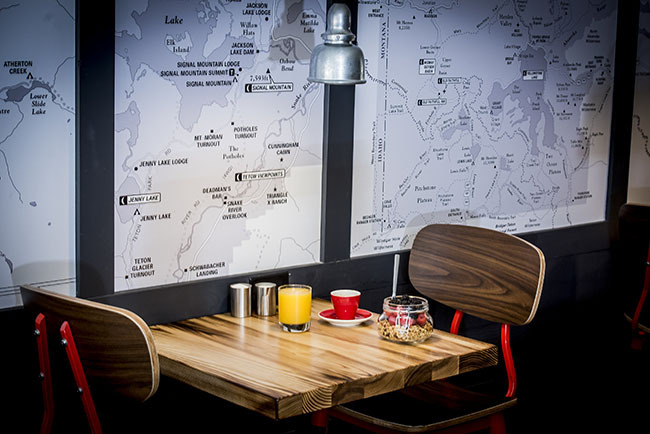 To further expand on the basecamp concept, every element of décor in the lobby serves a functional purpose. Shelves are populated with guidebooks and walls are adorned with outdoor equipment available to rent, such as backpacks, coolers, and snowshoes. The lobby essentially serves as an outdoor gear outfitter for guests. The Mountain Modern Motel is owned by Crystal Creek Capital and operated by the Yarrow Group, both of Jackson, Wyoming. The TruexCullins design team includes Kim Deetjen, Principal, ASID; Keith Nelson, Associate Principal, LEED AP; Jessica Holdredge, Interior Designer; and design consultant Joanne Palmisano.